Kyrgyzstan is a part of the GREAT SILK ROAD. Experienced tourists say «If you have not seen Central Asia, you have not seen the world!”. You can not imagine how many places you are going to see! During your Silk Road tour you will travel as ancient traders did. On your way you will visit ancient Burana Tower and the second largest lake in the world Issyk-Kul; also it includes visiting of the ancient Tash Rabat Caravanserai (Stone Castle), primeval stone inscriptions, churches, mosques and many other places of interest. 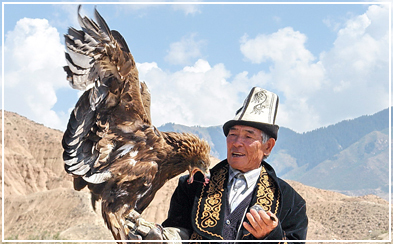 Kyrgyzstan is the place of untouched nature and long-standing traditions. China is famous for its bazaars and handicrafts, and Uzbekistan is a paradise for people who are fond of ancient architecture. You will find out about the nomadic life, taste national dishes of three different cultures and you will get vivid recollections!! !